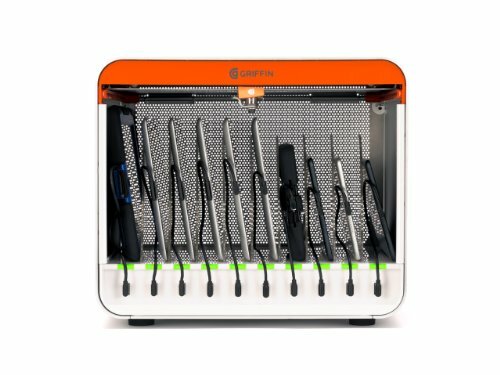 MultiDock is a single, space-efficient charging station for storing, charging, and syncing 10, 20 or even 30 iPad tablets or other devices. Its footprint is minimal: only slightly larger than a laptop computer. But in that space, each MultiDock unit packs storage, charging, and syncing capability for 10 tablets. Stack 3 MultiDocks together to sync 30 tablets in the same amount of counter space, from a single host computer. MultiDock uses Griffins exclusive ChargeSensor technology to optimize charging. ChargeSensor automatically detects the charging characteristics of each connected device and supplies the charging rate up to 10 watts 5 volts 2.1 amps of charging power per bay each device needs for fastest, most complete charging. Connecting an iPad 4, iPad mini or other device that uses Apples new Lightning charge/sync connector automatically activates MultiDocks Quick Charge Mode. MultiDock charges these newer devices at the fastest possible rate, even while syncing, thus ensuring that your devices will be fully charged and ready when you need them. And you won't have to remove your tablets from their cases: each MultiDock charging bay accommodates even bulky protective cases. At 1.25amp;quot; wide, MultiDock's charging slots are the widest available. MultiDock is designed for easily securing it on a table, desk, or countertop. Included hardware allows installations that stack up to three units in one space. Available wheels and handle kit make moving MultiDock safe and easy, and an available locking laptop tray secures MultiDock's host computer when it's in use or in storage. Adapter/Charger Type: Wall Charger For Device Type: Mobile Devices Power Sources: AC Wall Outlet Connector/Port/Interface: USB. If you have any questions about this product by Griffin Technology, contact us by completing and submitting the form below. If you are looking for a specif part number, please include it with your message.